When one choice can lead to triumph or failure, life or death, glory or destruction, what will you choose? With Choose the Future, you decide how, when, where, and with whom the Doctor will fight to save the world! 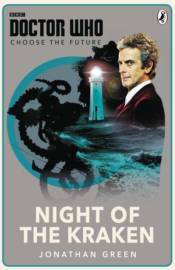 In this brand new adventure, Night of the Kraken, the twelfth Doctor meets a roguish time-smuggler and faces a terrifying creature from the deep with a plan to destroy the Earth. The fate of the Doctor and the universe he protects are in your hands!